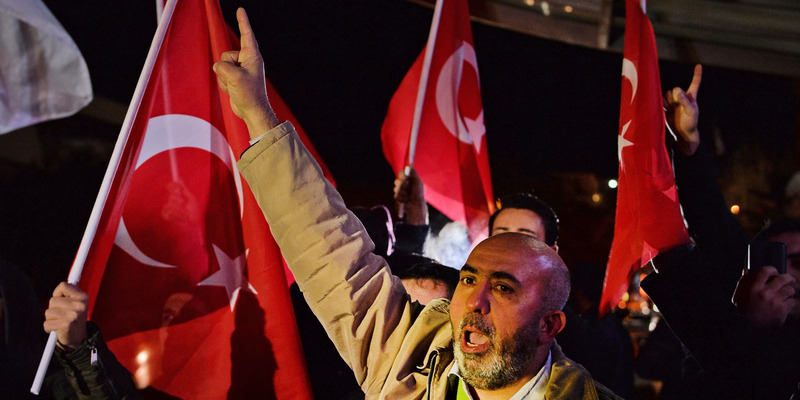 Depo Photos via APProtesters, some holding Turkey’s flags, chant anti-U.S. slogans during a demonstration near the U.S. embassy in Ankara, Turkey, Wednesday, Dec. 6, 2017. President Donald Trump’s decision to recognise Jerusalem as Israel’s capital has heightened tensions across the region. Palestinian leaders have called for “three days of rage” around the world, and US Marine units are on-call for all embassies. The US embassy in Jordan published a security warning telling US citizens that Trump’s decision may spark protests which “have the potential to become violent.” The statement urged US citizens to avoid large gatherings and to maintain a “high-level of vigilance” as tensions rise in the region. “Even gatherings intended to be peaceful can turn confrontational and escalate into violence,” the statement read. The US embassy in Egypt said that Trump’s announcement has “generated significant media attention,” and Americans in the country are urged to stay vigilant. The US State Department has warned US embassies across the globe to increase security. “We have contingency plans in place, in the event that violence breaks out across our area of operations,” US Central Command spokesman Maj. Josh Jacques told the Marine Times.